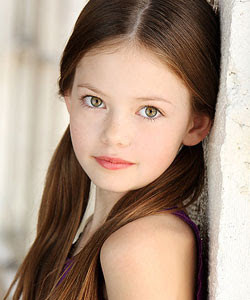 It's official--Mackenzie Foy has been cast as Renesmee, Edward Cullen and Bella Swan's vampire child in the next Twilight saga movie, Breaking Dawn. The 9-year old actress will play as the half-vampire, half human in the upcoming film set for release by Summit Entertainment on November 2011. Stephenie Meyer, the author of the book, also confirmed that Mackenzie was officially cast and wrote on a Twilight Facebook page that she is excited to work with the young actress. This last book in the Twilight series will be split into movies wherein part 1 will be released next year as I have already mentioned, and the last part on November 2011. I certainly hope that this is going to be worth the wait! Kirsten Stewart will still be Bella Swan, Robert Pattinson as Edward Cullen and Taylor Lautner as Jacob Black.